Attendance is down at Six Flags theme parks. Six Flags took a dive on Monday and not in a fun roller coaster kind of way. The theme park's shares plunged as much as 9% after the company disclosed an attendance drop. 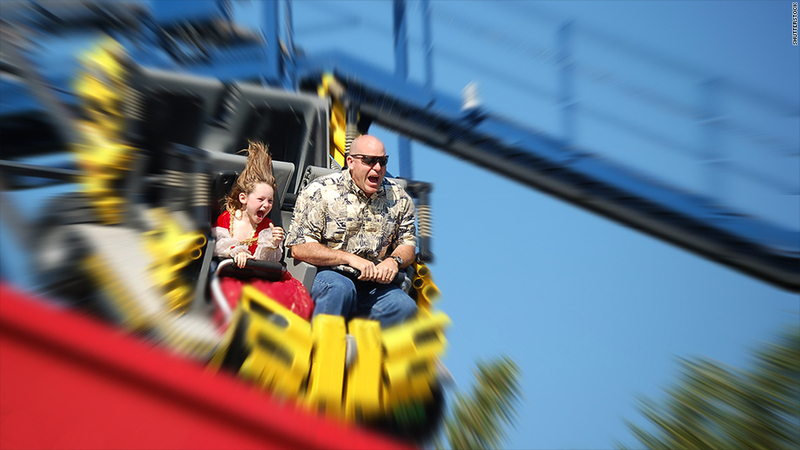 Only 8.2 million people went to one of Six Flags (SIX)' 18 parks in April, May or June. That was an 8% drop from the prior year. The company blamed the shrinking crowds on "lingering effects of the long, harsh winter" that extended school calendars and shortened many spring breaks. But Wall Street isn't buying that argument, sending the stock on a Kingda Ka-sized sell-off. "The path to recovery hit a little bit of a snag here. The growth trajectory has stumbled over the last couple of quarters," said James Hardiman, a senior research analyst at Longbow Research who covers Six Flags. The slumping Six Flag attendance figures surprised Hardiman, who had been banking on a 6% jump thanks in part to the later Easter holiday. The weather comments are also a head scratcher considering rival theme park operator Cedar Fair (FUN) says it has been seeing pent-up demand from thrill seekers who were stuck indoors all winter. "We are seeing first-hand the excitement our guests are experiencing as they leave this winter's snowy, cold weather behind," Cedar Fair CEO Matt Ouimet said in the company's earnings release in May. Cedar Fair recently reiterated a solid outlook for 2014 revenue, although the company did acknowledge some decrease in attendance. While Six Flags posted stronger-than-expected earnings, its revenue of $377 million trailed projections from Wall Street for $396 million. The theme park also said total guest spending per visitor jumped 11% in the second quarter to $44 a person as visitors spent more on tickets and goodies while roaming the parks. That's perhaps another indicator of the economic recovery. Investors may be wondering if the turnaround ride is over. 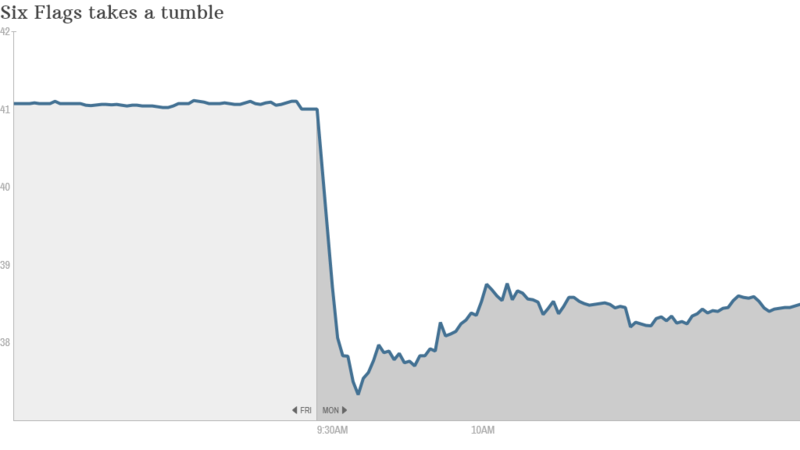 Shares of Six Flags closed at $39.31, down 4.1% on the day. Fellow theme park SeaWorld Entertainment (SEAS) shed nearly 2% on Monday. Slammed by the Great Recession and heavy debt, Six Flags filed for Chapter 11 bankruptcy in 2009. The theme park raced out of bankruptcy court, with its stock surging around 50% in 2011 and then again in 2012. But recently the ride for investors has more closely resembled the Enchanted Teacups than the record-setting Zumanjaro. Six Flags trailed the broader markets by rising only 20% in 2013 and less than 5% this year. "These guys had done a great job over the past few years as the company emerged from bankruptcy. But I think a lot of the low-hanging fruit has been picked," said Hardiman, who has a "hold" rating on the stock.